Sam Darnold, QB, USC (+150): Darnold appears atop the most mock drafts so far, but it felt like he was a more popular choice a couple of weeks ago than he is now. I really don't see him staying atop of drafts as things get closer to the big day. He had a great run in his first year as a starter, but last year he was less consistent, and I am not convinced that his nice measurables and arm make up for some unconvincing performances at times. Let's put it this way - if my team took him in the third round I'd be thrilled, but at first overall I would have indigestion. Josh Rosen, QB, UCLA (+200): Rosen's career has so far been more of what could have been than what was. He has played well, but he could have been so much better if he wasn't stuck on a mess of a team with an incompetent coach. At times he was able to overcome those handicaps and shine, and that is as good a reason as any to believe in him. So, too, is his impressive toolbox. I would take Rosen before Darnold, so it follows that I would bet on Rosen before Darnold. I don't see value in this price, though. Josh Allen, QB, Wyoming (+225): I just don't get this. His measurables are impressive, and he has a cannon where his arm is supposed to be, but he hasn't faced top competition, and he hasn't played consistently well against what he has faced. People often point to Carson Wentz and his success when pointing to Allen, but Wentz was winning national titles in bulk while Allen was on a middling Wyoming team. There is unquestionably upside here, but this is not a gamble a team with a high pick and a burning need should be making. Saquon Barkley, RB, Penn State (+600): By far the most momentum in recent days in mock drafts has pointed at Barkley. And on one level that makes sense - with so much uncertainty around the quarterbacks, perhaps the Browns should pick a freakish playmaker to build their offense around and then take a QB with another of their five picks in the first two rounds - or package picks for another high pick to take a QB. It could make sense, and Barkley is unquestionably special. History doesn't favor this pick, though. Since 1982 just two running backs have gone first overall - Bo Jackson in 1986, and another Penn State back, Ki-Jana Carter, in 1995. Since Carter was picked there have been 14 quarterbacks selected first. That's a lot of trends to overcome, and the NFL is not a league that likes to rock the boat. I can make a strong argument to take Barkley, but I can't bet it will happen at this price. 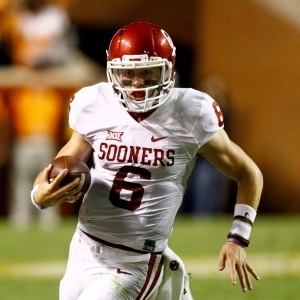 Baker Mayfield, QB, Oklahoma (+800): If I had to take one player it would unquestionably be Mayfield. He's brilliantly-smart quarterback who has made attending the Heisman ceremony an annual engagement. This year he faced a change in head coach very late, and he responded with his best season yet - that shows he can handle adversity. He's far more proven than the other three quarterbacks, and though he's not a giant he's clearly more than big enough to play the game well. If the Browns are committed to taking a QB then I tend to believe that the more they compare the options the more Mayfield will emerge. I'd bet him at this price. Bradley Chubb, DE, N.C. State (+2500): Chubb is impressive, but with Myles Garrett and Emmanuel Ogbah already on this line this doesn't feel like a need that is burning enough to use a top pick on. Minkah Fitzpatrick, DB, Alabama (+2500): Fitzpatrick is a total freak. But you know the last time a DB went first overall? Gary Glick in 1956 - out of Colorado A&M and taken by the Steelers. He's the only guy in the defensive backfield ever taken with a top pick, and I don't see Cleveland changing that - if only because of the amount of grief they would take for doing so. Get free picks from any of Doc's Sports expert handicappers - and with no obligation or credit card. You can use these free picks for any sport, and you will never deal with a salesman. Get $60 worth of premium members' picks free .